Reading through the OCA website last spring, I came upon the web flyer for the Parish Ministries Conference, “Faith in Action.” The conference, scheduled for late July at St. Vladimir’s Seminary in Crestwood, NY, promised workshops dealing with end-of-life issues and grieving, immigrant assistance, youth and schooling, parish nursing, and family enrichment, as well as serving specific need-based groups and international ministries. After attending the conference, I can say that, indeed, faith in action was demonstrated by both the presenters and the participants who shared their ministries within our Holy Church. Prior to the start of the conference, relics of St. Herman of Alaska were given to Fr. Thomas Moore, a member of the conference coordinating team, as he stood in the seminary parking lot. These relics had been bequeathed to the seminary by an individual whose executor had brought them and was seeking someone to leave them with. What a gift to the Church and to the conference, the relics of the man who brought the Holy Church to America. “Discerning and Developing Talents in the Parish,” a workshop given by Fr. Steven Belonick and Fr. Vladimir Aleandro, was both the first presentation and the theme of the event. The Epistle of Paul to the Romans, Chapter 12, provided the biblical basis for this: “If [a man’s gift] is in serving, let him serve; if it is teaching, let him teach; if it is in encouraging, let him encourage; if it is contributing to the needs of others, let him give generously…” (Romans 12: 7-8) Inspiring talks bringing the Apostolic admonition to identify one’s talents and find a way to use them for Christ proved to be the prevailing focus of the conference. Keynote addresses over the next two days further developed this focus for the workshops. Fr. Sergei Glagolev, the first keynote speaker, encouraged participants to witness Christ’s love by “fanning the flame within” and carrying it out into the world as a steady witness of the Holy Spirit. Reminding us that Church ministries are ways to bring us to theosis, Fr. George Gray gave the second keynote address and provided an inspiring biblical survey of the gifts provided to the faithful for ministering to the body of Christ. We are Christ’s stewards and are asked to take charge of what the Master owns, by preparing, training, qualifying, and setting ourselves to the tasks He has for us under the mantle of His love. 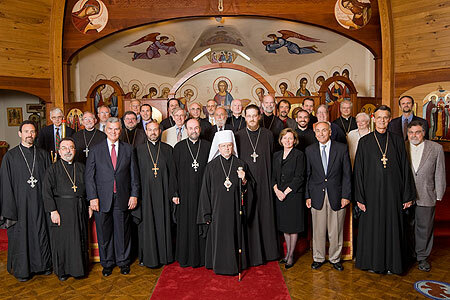 Participants at the conference, representing twelve dioceses (from three Orthodox jurisdictions), demonstrated a broad range of talents in diverse areas of concern. Many work with elderly and disabled individuals. Youth and family interests were represented. Some have areas of focus on both professional and volunteer levels. Outreach efforts to assist people leaving prisons were also highlighted. Both in workshops and displays, attendees were able to initiate stimulating discussions regarding their work and ideas for developing similar ministries in other parishes. Clearly resources within our Church abound! A variety of formal and informal parish ministries were discussed. Many of our parishes have immigrants, and the workshop “Reaching Out to Immigrants” offered ideas for assisting them in establishing their new homes in America. Programs that are effective in parishes for both settling immigrants and helping them find their place within the parish community were discussed. Questions regarding the use of multiple languages in services versus English only were raised. We were encouraged to “assure the spaciousness of our Church” in reaching out to immigrants and were reminded that an appreciation of both the culture of origin and the struggles immigrants face in confronting their new lives was very important. Other ministries that were highlighted included Raphael House of San Francisco, which serves families in crisis; St. Matthew House in Columbia, Maryland, a home for the disabled; and Martha and Mary House in Escondido, California, providing shelter and guidance for unwed mothers. Representatives from International Orthodox Christian Charities, the Orthodox Christian Mission Center, Church World Service, and Project Mexico came and shared their active ministries with requests both for financial support and for parish involvement in mission activities. The OCA’s program for the adoption of Russian children was presented as well. In each parish there are individuals struggling to meet the demands of caring for the ill and elderly. The issues faced by these individuals were discussed in workshops such as “End of Life Decisions,” “Visitation Ministries,” “Family Caregivers,” and “Seniors as a Resource.” St. Nicholas Parish in Portland, Oregon, has an “End of Life Manual” on their website for those who wish to put their affairs in order before death . Models for establishing lay visitor programs and information about supporting those who are engaged in daily care of ill family members were presented. While recognizing the increasing frailty of our older congregants, it was emphasized that we must not forget that they are often an untapped resource eager to be included in the ministries of their parishes. For those whose focus is on youth and family life, a variety of workshops were held. “Youth and Young Adults in Outreach,” “Family ‘Fun Raisers,’” “Strengthening the Parish Family,” “Family Life; Problems and Resources,” “Supporting the Military and Their Families,” as well as “Helping Young Families in the Parish Community” were among the conference offerings. Two areas of increasing interest among Orthodox families are church schools and home schooling. Two models for Orthodox schools were presented as well as information for families schooling their children at home. It was evident that a conference devoted to the topic of educating our children was needed. Social issues that must be addressed by the Church were discussed. “Orthodox Prison Ministries,” “Addiction and Recovery,” “Protecting the Unborn,” and “Conflict Resolution” were conference topics. Many professionals and lay persons have developed or are involved in ministries that seek to aid individuals in finding Christian solutions to their problems. Some have personally dealt with addictions or have grieved the loss of loved ones. Some have assisted others with these and other life crises, such as the psychic trauma and guilt that often follows an abortion. They are bearing witness to the life-saving strategies available within the Church. Zoe for Life was presented as an organization of Orthodox Christians that is responding to the high rate of abortion among Orthodox women, through their crisis pregnancy counseling hotline and in the work of chapters formed in congregations throughout the United States. Each ministry identified resources for parishes that are available through the internet and by telephone. Those who attended the conference have information they can now share with their parishes and should be asked to do so. Of special note was parish nursing. This sub-specialty of professional nursing seeks to embrace health-promoting activities within faith communities. With declining health care coverage across the nation, congregations are seeking to find ways to assist parishioners in having their health needs met. There is growing interest among Orthodox nurses in developing this supportive ministry within their congregations. Parish nurses are able to conduct health screening clinics (such as blood pressure monitoring and stroke awareness), provide information on health resources within their communities, and provide counseling and support related to health and wellness issues in an Orthodox context. Parish priests are becoming increasingly aware that nursing can offer them support in ministering to the health concerns of parishioners. Professional training is required for those seeking to become parish nurses. The possibility of offering a class for Orthodox nurses was discussed with the conference presenter, Karen Hadley, RN, MSN. She may be contacted through St. Nicholas Parish, Portland, Oregon. Many communities may not realize the wealth of information contained in the OCA “Resource Handbook for Lay Ministries.” While it may be noted that the conference was a “living resource handbook,” each congregation has available to it the hardcopy as well as an internet version of this written document. Many of the ministries and concerns addressed by the conference are outlined in this book. Everyone is urged to become familiar with it and use it as ministries are developed within their parishes. Talented individuals throughout our Church have contributed to this constantly evolving resource. Such a conference is not held without the hard work of an organizing committee. Special thanks and kudos are due Donna Karabin, Arlene Kallaur, Kitty Vitko, and their team for their tireless efforts on behalf of the entire Church with this assembly. The seminary was a welcoming and hospitable site. For those who were not able to attend the conference, see what you missed! Those who did attend can bring to their home parishes a wealth of information and resources. Please ask them and listen as they share what they have received. The more we share with one another, the more our Christian response will grow and bear witness to the Lord, and the closer we will come to our own salvation. This is the Gospel message: to go and serve the Lord with eager hearts and loving hands. Elizabeth Lien is an active parishioner at Annunciation Orthodox Church in Milwaukie, OR. As a registered nurse, she is the Parish Nurse at Annunciation Parish. She currently home schools two of her children.